A tall stone tomb consisting of a stepped pedestal on a low plinth, with a tapering shaft topped by a garlanded urn. On the front panel is a relief of an angel carrying an infant, based on ‘Night with her Children’, by Danish neo-classical sculptor Bertel Thorvaldsen (1768-1844). Harry’s inscription is on the front block beneath the angel. It is hidden near the cemetery wall in the shade of a huge horsechestnut tree. Harry was the only child of Tom and Ann Hall, and died at the age of seven. 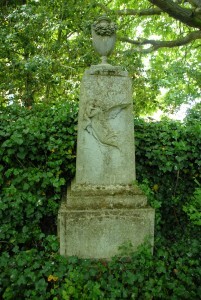 His grieving parents erected the monument in 1866 and were later buried there too.